Have you ever wondered why your beauty therapist tells you to come back for your next wax in 4-6 weeks time? Perhaps thought that maybe you should come sooner or much later? Hair is far more complex than it appears on the surface. At any one time a random number of hairs will be in one of three stages of growth and shedding ; anagen, catagen and telogen. 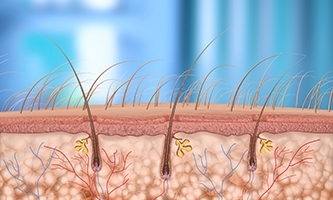 80-90% of hair is in the anagen phase of the cycle, meaning these hairs are actively growing daily. These stages of growth are also the reason body hair does not reach the lengths of head hair; it enters the catagen or resting phase much sooner. The growth of hair, whether it is on the face or body can be affected by age, gender, genetics, ethnicity, hormones levels. Even the environment or season can have an impact. Speed of growth can vary from area to area on the body. Facial hair is typically the faster growing than body hair, especially on males. It takes only a couple of weeks to grow with the exception of your eyebrows which can take anywhere from 56-73days to regrow. On average body hair takes around 2-3 weeks to grow, of course this varies greatly on your choice of hair removal method, which could push regrowth time to 4-6 weeks. Hormonal levels can affect the rate and density of growth, for example conditions like hirsutism and polycystic ovary syndrome. Pregnancy hormone can also cause hair to growth faster, darker and in new areas where hair was not as prominent. Environmental conditions are thought to affect the speed at which hair grows. Warmer climates cause hair to grow faster whereas colder climates slow the growth. The climate to which you expose yourself to daily can affect the condition of your skin and hair and overall affecting how your hair might grow. For example people surrounded by air conditioned controlled environments might have dry or dehydrated skin and hair which can lead to breakage. Those with Asian ethnic backgrounds are said to grow the least amount of terminal hair. Whereas Hispanic and middle eastern have the most. Also those that come from African backgrounds have much slower growth of than those from European ethnicities. All bodies are completely different so some may need to come sooner and some may push it later. This time frame is just an average that works for most clients, really it all comes down to knowing how your body works and learning how your hair grows.